What would happen if high-stakes exam was eliminated for NYC specialized high schools? Mayor Bill de Blasio and Schools Chancellor Richard Carranza proposed last June that the grueling, high-stakes test for admission to the city’s top eight high schools, including Brooklyn Tech and Brooklyn Latin School, be eliminated. Using one test as the sole criterion for admissions has been called unfair and discriminatory, especially to kids of color with access to fewer educational resources. Under the proposed plan, admissions would instead be based on factors such as students’ ranking in the top 7 percent of their middle school and top 25 percent citywide (using grades and scores on the state’s assessment tests). The proposal would require legislation in Albany to amend the State Education Law. What if these new criteria had been in place for school year 2017-2018? About 19 percent of admissions offers would have gone to black students, compared to the less than 4 percent who actually attended specialized high schools in 2017-2018. Hispanic students would have received about 27 percent of admission offers, compared to the 6 percent of Hispanic 9th graders who attended the schools last year. The number of Asian students receiving admissions offers would have fallen by about half, to just over 31 percent. The same number of white students would receive offers. More female students would have received offers to attend the specialized high schools, up to 66 percent compared to the 41 percent of female ninth graders who actually attended last school year. Students in poverty would have made up 63 percent students offered admission, compared to the roughly 50 percent last year. Students offered admissions would have had slightly higher grades on average, but lower scores on the state’s English Language Arts and especially math tests. Some studies have found that grades provide a better predictor of future student success compared with performance on standardized tests. But opponents of the mayor’s plan say that some students admitted under the new criteria would not be able to handle the high level of coursework provided at the specialized high schools. They also say that basing admission on rank in middle school is flawed because some middle schools are more competitive than others. 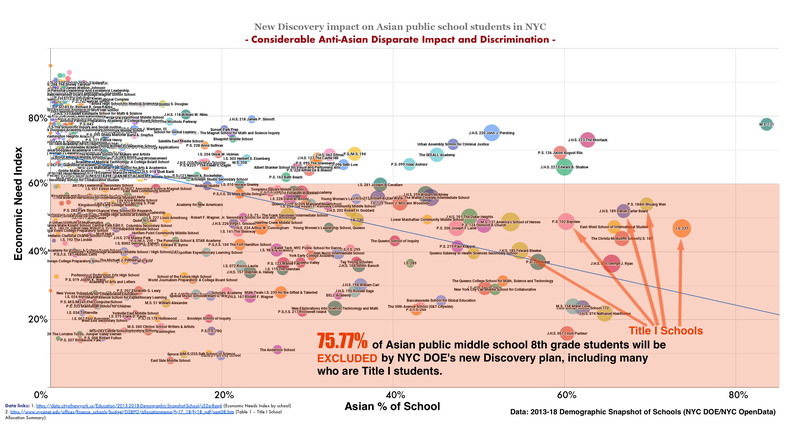 Traditionally, the majority of eighth-graders admitted to the city’s specialized high schools are Asian (52 percent), followed by white students (27 percent). Latinos make up roughly 6 percent, and black students roughly 4 percent. After the mayor announced his plan, Asian families protested the change. “We feel you cannot punish the people who work hard and then they get in. Specialized high schools [are] trying to get the people who work harder, and they can help the future of the country,” Jerry Lo, who attended a protest in Cadman Plaza Park, told the Brooklyn Eagle. Surveys show that Asian children spend more hours doing schoolwork than members of other ethnic groups in New York City. “Chinese students study very hard because we are all immigrants and we are looking for a better life here,” Lo said. At a meeting in Park Slope earlier this month, according to Patch, parents told Department of Education officials that the plan wouldn’t work in their district, where many families choose to opt out of the state tests. The specialized schools include Brooklyn Technical High School, Brooklyn Latin School, High School for Math, Science and Engineering at City College, Bronx High School of Science, Stuyvesant High School, High School for American Studies at Lehman College, Queens High School for Sciences at York College and Staten Island Technical High School. There’s the common argument that students who get SHSAT offers have worked very hard, hence it’s unfair to replace the SHSAT exam. But that argument ignores the fact that students who excel throughout the entire year at school to be in the top 7% of their entire school probably worked just as hard or even harder. And also these students also worked hard to excel in their state scores. Regardless of what measure we use for determining a student’s academic merit, these students would have worked very hard. And I’d argue that maintaining a top 7% rank at school is harder than passing a single 3-hr multiple-choice exam. Students maintaining a 7% rank of middle schools are graded subjectively by teachers who do favor certain students over others. I, my siblings, friends, and my child went through public school systems that we saw how some bias teachers who grade differently on students with same academic performance. Middle school’s GPA is not objective. Statewide exams are much easier than SHSAT which has lots of logical questions. It is partially due to long hours of studying and preparations for SHSAT and partially due to a logical test based on heavy math and science. Not all students favor STEM. Some students are passionate in performing art, fine art, liberal art, and sports. Most of all, SHSAT does not see race, religion, gender, social status, economic status, sexual orientation and the grading system is Neither emotional Nor personal but a computerized scanning answer sheet machine which render it very objective. When DOE’s proposed change to phrasing out SHSAT within 3 years by admitting top 3% in year 1, top 5% in year 2, and top 7% in year 3 of all middle schools’ students into specialized high schools, it is telling all elementary schools students that they have 97% in year 1 , 95% in year 2 and 93% in year 3 of NO chance to be admitted into specialized high schools regardless of which middle schools they apply for enrollment. DOE in a way is giving 93% to 97% of students NO motivations where they face only 7% of chance after 3 years but 93% of chance for not being admitted into specialized high schools (SHS) Lacking motivation is contradicting the inherent purpose of education. No offer of any incentive to 93% of students is a recipe for failing public educational system where some parents would send their kids to private schools or parochial schools, or even move out of NYC. By then, Governor Cumo can no longer blame the weather for more middle income families moving out of NYC. On top of it, this proposed change of DOE will ruin the high reputation of many middle schools and their neighborhoods’ real estate value will be deflating. .I fortunately graduated from CCNY now CUNY before the Open Admission polices were implemented in the 1960s. The same call for “social justice” and minorities being unrepresented drove this academic suicide policy. An article by Heather MacDonald … Downward Mobility in the City Journal Summer of 1994 details the failure. One section of a long article. Since the schools will now have to let in thousands of minority students who can’t pass the current demanding curriculum, standards will fall to prevent massive grade failure. Of course, it will be blamed on racism and the teacher’s inability to teach. Oh, I forgot it will also be the fault of Asians families who are overly aggressive in demanding that their children study hard and get good grades. What a quaint and out-of-date belief. Thanks … I didn’t realize the full impact on Asians – Americans. Why discriminate against those who didn’t want to go high school at all. Just do away with all these troublesome diplomas …they just cause strife. Have just one for everyone . It will be the De Blasio Degree with a smiling face of the Mayor. No one will now be left out. Each middle school has different levels of standard. Top 7% of any middle schools are not at the same level of standard as Mark Twain, IS 187, Dyker Heights, NEST+M, Townsend, MS 51, Leon Goldstein, McKinney, and many other middle schools Gifted Program in Science, Technology, Engineering, & Math (STEM.) Simply put these high caliber middle schools with a focus of STEM already prepared the students for 3 years where many of them got admitted into specialized high schools. Before they got admitted into these high caliber middle schools, they were in elementary schools who all passed the cut off point of OLSAT (entrance exam for middle schools’ gifted program in STEM). In the other word, most students who got admitted into specialized high schools have prepared as young as kindergarten at elementary schools. What DOE needs to do is fixing the “pipe line” of education since kindergarten till 8th grade in order to prepare them for hard cored curriculum of specialized high schools or even 12th grade for college readiness. 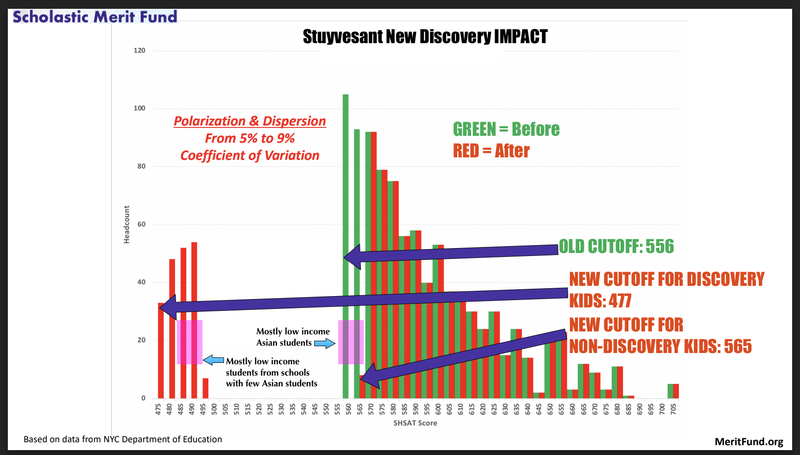 A quick fix by abolishing SHSAT based on racial quota is education racism. All education should be judged on students’ skill – not their skin colors. It’s not just minorities. The SHSAT is also biased against girls. Girls are over-represented in middle-school. They perform better than boys in middle school and specialized high schools. They take the SHSAT more than boys, but receive fewer offers. The mayor’s proposal increases female offers from 44% to 66%. The argument that allowing minorities into a school will ruin it is a very old one. CUNY isn’t “ruined”, it improves the lives of thousands of poor NYers every year. But I guess to an elitist that doesn’t matter. The SHSAT is as biased against girls as teacher evaluations (grades) are biased against boys. Sunset, you are comparing the projected offers to girls (66%) with those girls who accepted (44%) the previous year. Apples v. Oranges. Do you have data on the rate of girls with offers who declined them to attend schools such as Beacon, Bard, LaGuardia, ElRo, where girls outnumber boys? If so, please share. As for your point regarding minorities ‘ruining’ schools, most would absolutely agree with you. Asians are minorities. And they have raised bar for everyone. I agree with Jgfox comment that CUNY was once crowned the “Ivy League of NYC” whose academic standard has plummeted since open admission. Similar practice happened to some schools in Florida and Texas by removing entrance exam where those schools’ standards also dropped. SCA5 was proposed in San Francisco for removing entrance exam which was overturned where Carranza was a proponent of SCA 5 who left to become NYC DOE Chancellor for doing the same thing by removing entrance exam to elite schools. All elite high schools have entrance exams as well as SAT for college, GMAT or GRE for graduate schools, LSAT for law schools, MCAT for medical schools, and other entrance exams for professional schools as well. 1. Not all elite high schools have entrance exams. This is false. 2. Secondly, we are keeping the entrance exam. We’re just using an exam that every student takes, rather than an optional exam that not every student knows about, is encouraged to take, etc. 3. The issue isn’t an entrance exam. The issue is that we’re using a single exam as the SOLE measure of a 13 yros. NO, 50 math and 50 English multiple-choice questions CANNOT give us a students complete academic merit. No psychometric testing expert believes this is accurate. They ALL recommend multiple measures as the mayor proposes. Our future being sacrificed on the altar of identity politics. I am a black alumni of Brooklyn Technical High School, and this newly proposed scheme is patently offensive. Studies have already proven that the SHSAT is a predictor of of success in these schools. Admissions to the schools is NOT a reward for being among the top students in ones middle school, it is an honor bestowed upon those that are the top student in the entire city of New York, as judged by a single scientifically validated objective test, now if you want to add in scores from other test, such as state math and reading scores, then thats ok as well, but everyone must be compared against ALL competitors, not just those in their middle school; and grades obviously cannot be a factor, since the competition level at schools will vary. For example, do we really believe that a 90 average at a typical inner city school, in a “non-gifted” classroom is equivalent to a school where many of the students have already started taking high school math? You are not comparing like entities, so the outcome would immediately be invalid. – Asian students study very, very, hard, and have extremely high expectations of themselves. – We are the best at rapping. – Black children are by far the greatest users of social media, by time, maybe they should be studying instead of using twitter and facebook. – Black parents need to involve themselves more in their childrens education, go to most inner city schools during open school night, and the school will be empty; this is an issue. In summary, admittance to these schools is not some sort of lifetime achievement award for middle schoolers, they are highly selective schools that seek to admit the smartest middle schoolers in the city. If blacks and hispanics want to do better at the game, we need to become better players of the game; asians simply play the game better, while black and hispanic parents want to change the rules, to achieve a desired effect, based on a feeling of entitlement. I know what I am talking about because I am black, grew up dirt poor, yet me and all 5 of my brothers and sisters attend specialized high schools. We had a father in the home who checked our homework every night, checked our notebooks on a regular basis, did surprise checkins at the school, never missed an open school night, and made us study relentlessly for standardized math and reading tests, taught us how to read very early, did not accept bad behavior or fighting in school AT ALL. We must prioritize being elite academic contributors, as opposed to being the primary source of sports and entertainment for our country. Admission should not be determined by an ability to spend $10,000 for test prep classes.